A school bus carrying eight deaf school-girls and their teachers brakes suddenly on a flat Kansas highway. They should never have stopped. Waiting for them are three heartless men just escaped from prison — each with nothing to lose. And now, with the girls as their hostages, they have everything to gain. They make their stand in an abandoned slaughterhouse, and it is there that Lou Handy, a murderer and the convicts’ ringleader, announces his terms: to kill one captive an hour unless his demands are met. What follows is a twelve-hour siege of noose-tight tension — and a war of nerves between Handy and the FBI’s senior hostage negotiator, Arthur Potter. 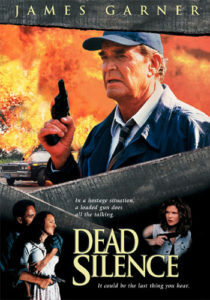 Dead Silence, based on A Maiden’s Grave, was made into a movie, starring James Garner and Marlee Matlin. It was filmed by HBO in 1997. "A topnotch thriller with an unexpected kicker at the end." "Deaver brilliantly conveys the tensions and deceit of hostage negotiation"